If you are reading this magazine, chances are you probably have a garage. 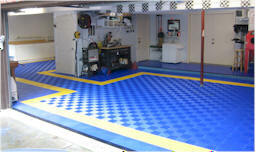 Over the last decade, there have been only a few flooring systems that have come to the market place. Aside from an unfinished concrete floor, your choices were pretty much limited to an epoxy based paint or concrete stain. Although these systems can turn your floor into a master piece overnight, give it a year or two and you will inevitably notice, paint cracking/chipping, discoloration and stains that just won't go away. Your options until recently were to strip, clean and re-paint. A tedious and daunting task, to say the least! 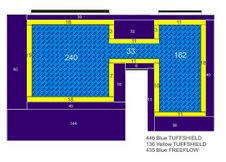 Today a new product has been recently hitting the residential market, referred to as modular flooring. Several manufactures have been producing this for commercial applications for a while now and only recently brought to the consumer market. Modular flooring is similar to a "wooden" floating floor, common now in homes around the world, except rather than interlocking wood boards, it uses interlocking square tiles. We obtained sample material from several manufactures and although similar, we found RaceDeck www.racedeck.com (a Snaplock Industries company) seemed to have a higher quality product, with many more options available to the consumer. We were also impressed that their product was produced in the USA, yet priced comparable to imported options. 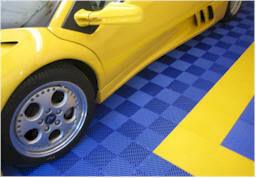 RaceDeck is available in several designs including a multitude of colors. You can purchase the tiles in either 12" or 18" sizes that come preassembled in a group of 4, for fast installation. The modular aspect of their systems allows for any of their product lines to be compatible. This means that you can get very creative with your designs, color and material. It is also not permanent, meaning you can easily remove, change, move or replace tiles as you need to. Tiles are made from a very resilient high impact copolymer and can withstand a lot of abuse. 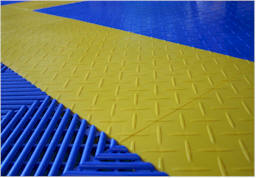 Aside from the different tile patterns and sizes, RaceDeck offers both a solid and free flow tile. The free flow tiles are just what the name implies, in that the tiles are slotted so that water\liquid can pass. Why is that important? If you live in an area with snow or even if you pull in with a dripping wet car, the water or snow will drip off the car forming a puddle of water. With the Free-Flow tiles, water will run through the tile, allowing the water to evaporate later without leaving puddles all over your floor. 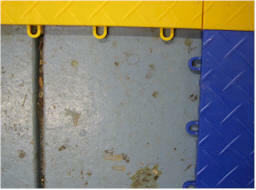 They also offer two design patterns including a chemical resistant epoxy version called Tuffshield. To finish off the edges, they have edge caps and a line of other accessories to complete your new floor. Installation was a "snap", literally. Before we ordered the tiles, we made a floor diagram, measuring the square footage. 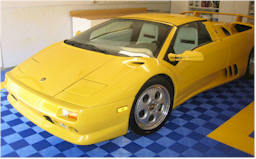 Being we were building a floor for a Lamborghini owner, we wanted to incorporate an nice esthetic pattern. 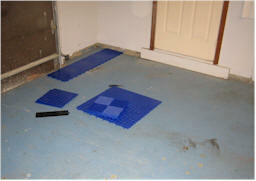 The installation used a combination of the Free-Flow and Tuffshield products in two different colors. 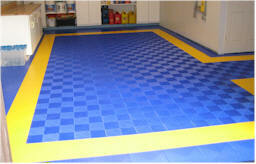 If you have ever installed a floating floor, this was just as easy, if not easier. You simply start in one corner (preferably the front of the garage where the cars would come in and out as this is the most visible portion) and keeping with your pattern, you work across and down. The tiles simply snapped to each other using either your foot or a rubber mallet. There is no concrete prep work, other than a good sweeping, however if you have an area that is not level or needs repaired, you should do this before you begin laying the floor. We laid our floor with more than 1000+ tiles in a little less than 3 hours with two installers. The front edges were dressed up with bevel edge pieces. The back and sides we put the last full tile that would fit then measured and cut the last row of tiles to finish where the tile met the walls, leaving about 1/2" for expansion (The same as you do with wooden floating floors). The hardest part of the whole process was removing everything from the garage and putting it all back. The installation was a easy as playing with Lego's. The fact that you can replace damaged tiles or remove to clean is a tremendous bonus. There were no messes and the flooring looks amazing. 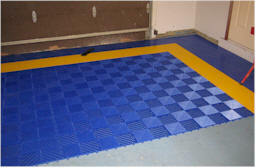 If you do use the Free-Flow tiles, we recommend using a flat board under any jacks or jack stands. We noticed the pin point force of a jack corner was enough to damage a tile. However we suggest you order a few extra solid tiles, they make a great cushion for jacks over the Free-Flows. We also recommend that you buy a few extra for repairs or accidental cuts. 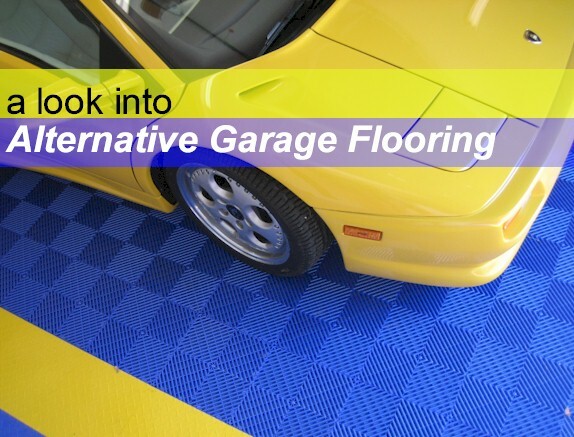 Although RaceDeck is just one option for a modular flooring system, they are certainly a company that you should consider. The costs per tile depends on the style you use and the quantity ordered, however cost vary from $2.79 to $4.50 per square foot. You can purchase RaceDeck by visiting www.racedeck.com. Starting at the far right corner the first three tiles set the foundation for the rest of the garage. After about 10 minutes the design starts to show. RaceDeck's patented locking system makes installation a "snap." The completed floor on the extended side. Elegant yet tough and ready for the cars!